Almost every shingle manufacturer makes its own asphalt-based ice/water shield or equivalent that seals directly to the plywood and around fasteners. It’s a roofer’s best friend and should be used generously in vulnerable roof areas. Unfortunately, 15# felt is commonly substituted in its place. 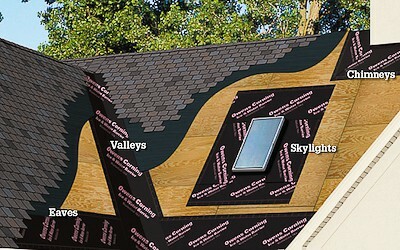 Some of the brands of ice/water shield we commonly use: Owens Corning WeatherLock and CertainTeed WinterGuard. We use this flexible, self-adhering barrier around critical penetration points on your roof, such as chimneys, roof-to-wall areas, plumbing pipes, valleys and lower-pitched areas on the roof deck.